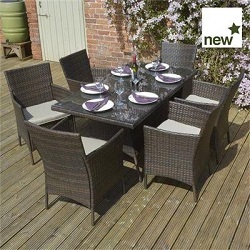 Select from our extensive range of timber, rattan and metal garden furniture and entertain in style in your garden. Our range includes large and small garden furniture sets to suit small patios or larger terraces, sunloungers for by the pool or relaxer chairs for the sun room or conservatory. All from big brands such as Norfolk Leisure, Zest4Leisure, Rowlinsons, Grange Fencing to name a few and of the highest quality.